Debbie Yee Lan Wong is a Chinese Canadian author who openly supports and agrees that the Beijing government needs to address the plight of people inside Tibet. She recently visited Tibet and even wrote a book disclosing the realities inside Tibet. Following is as a result of an online chit-chat with the author, and the author points out that bridging between the sides--Chinese and Tibetan public is the key to end the ongoing conflict. 1. How did you first come across the Tibetan issue and why did you decide to visit Tibet? I heard about the Tibetan issue back when I was in university in Vancouver, Canada. Many student protests about "Free Tibet" occurred on campus and I didn't really fully understand what that all meant. It wasn’t until 1999 when my former spouse and I relocated to the Canadian Embassy in Beijing where I understood the issues a lot more clearly. Through discussions with other Canadians and reading more about Tibet, I learned about the human rights issues happening in both Xinjiang and Tibet. Then in 1999, my work contract ended in Beijing and I left for Tibet for a month. Many of my friends who had traveled through Tibet shared how much they enjoyed visiting the monasteries, mingling with the locals and learning more about Tibetan culture. I felt the excitement for the first time and my curiosity was piqued. Although I enjoyed my time there, I witnessed the tension between the Tibetans and the Chinese, such as the furtive over-the-shoulder glances of the Tibetans in the monastery hallways and the paranoia in talking to anyone about the issues. 2. Many visitors, especially writers and journalists say getting an entry permission to visit Tibet is very difficult. So, how did you manage to get a visa to Tibet? Yes it can be quite difficult getting a visa. In my travel memoir THE SAME SKY, one of my chapters called Waiting describes the long delays in getting a travel permit. We stayed in Chengdu for days before we got any clearance. As for my visa, I already had a working visa as part of my short term work contract in Beijing. 3. Tibetans who were born in exile always dream about visiting Tibet and for many of them, Tibet is not just a “home country” but a “paradise”. What was it like to be in Tibet and what was your first impression? Tibet is indeed beautiful both in its scenery and its people. My first impression of Tibet was formed when our public bus broke down just outside the Lhasa airport. I went for a walk and I marveled at the gorgeous blue cloudless sky and the way the air smelled so crisp. The mountains looked like a line of camels in the distance. And throughout my time when we traveled by land cruiser from Lhasa to the borders of Nepal, I was in awe of the vast SPACE. I felt so infinitely small there and yet so connected to the locals who share with me a common passion for Buddhism. Another impression I had was that the Tibetan's passion for their religion is so deep. Every town we passed had a stupa and prayer flags strewn across the building tops. I remembered how my Tibetan driver shared that even if his right to practice his religion is taken away, no one could take away the beliefs in his heart. I believe this. You see people's dedication to Buddhism in the way the people congregated at the monasteries with their prayers beads and spinning prayer wheels. Most people I met expressed their dedication to the Dalai Lama and their steadfast hope that he'll one day return. 4. Foreign journalists and overseas Tibetans who managed to visit Tibet in recent years say they were often being followed or interrogated by the local authorities. Did you feel any hardship or censorship? I personally didn’t experience any real hardship during my time in Tibet. However, we were constantly stopped at checkpoints and at all the monasteries, police roamed the grounds and watched us. Sometimes the police followed me and actually told me to not talk to any of the local Tibetans who sometimes avoided me anyway for fear I was a spy. Since I’m Chinese Canadian, many thought I was from mainland China until I shared that I was from Canada. In private, many Tibetans opened up to me and shared their personal stories of strife and hope that life can be better one day. 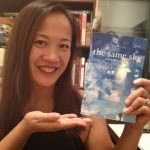 5 Tell us about your latest book “THE SAME SKY.” Does the book tell anything about Tibet? THE SAME SKY is about my solo journey through Tibet, Laos and Cambodia following a breakup. The trip revealed the painful human histories of these countries, particularly in Tibet, through personal encounters with locals who have lived through war, poverty and political repression. Their stories and small acts of love helped me heal and find the courage to believe in myself again. The book is an emotional journey of rediscovering peace and strength after a traumatic event, and I hope that my story will inspire any reader who has struggled to move on from betrayal and loss. Even if you’ve never been to Asia, THE SAME SKY is for anyone who has experienced heartbreak, grief and betrayal. It’s a story with universal themes of love, independence, and revelation of the human spirit. 6. Do you plan to visit Tibet again in the future? If yes, don’t you fear that the local authorities might arrest you or send you to jail for disclosing the realities inside Tibet? I would like to visit Tibet again one day particularly the Mt. Kailash area although I’m not sure I’d get a visa at this point given how open I am about my views on Tibet. 7. What do you think about Tibetan government in exile’s struggle for genuine autonomy? Although I was born and raised in Canada, my roots are Chinese and I’m proud of my Chinese heritage. So when I was in Tibet and I experienced the tension and the mistreatment of the locals, I felt sad. I do believe strongly in a free Tibet with genuine autonomy one day. Every country should have autonomy including the freedom to practice one’s religion freely, to vote, and to express oneself without fear of reprisal. When fundamental human rights are violated, I have a problem with that. I realize it’s such a complicated issue and my hope is that the Tibetan people can live more freely without scrutiny, and that the Chinese government can collaborate and work towards a better partnership with the Tibetans. 8. Tibetans believe building bridge with the Chinese public is the key to end the China-Tibet conflict. So before bridging with Chinese masses in mainland china, how exile Tibetans can build a genuine friendship with the over sea Chinese? Yes just like what you’re doing with this blog – communicate, share ideas, reach out and educate. Building friendships with the Chinese community is key before any change can occur. Different perspectives can be heard on both sides and the more we understand the needs, the better. NOTE-- To read more about the author and her works, click here. If you are living in New York and would like to catch up with the author. Well, Tibet House in New York is holding a reading event and book launch of the author's work The Same Sky on February 28 . Looking forward to attending the book launch. I think support and solidarity from Chinese public should be enough to convince all Tibetans including Tibetan Rangzen activists to follow the Middle Way Approach. I thank and appreciate Ms Debbie Wong for her truthful views on Tibet and about complicated Tibet issue. It's commendable to know her genuiene feelings from her admission about Tibetan people in Tibet. I will have a copy of her book "The Same Sky". I am convinced from reading her mind that the middle way approach alone holds hope for mutually beneficial resolution of Tibet issue. I thank and appreciate Ms Debbie Wong for her truthful views on Tibet and about the complicated Tibet issue. It's commendable to know her genuiene feelings from her admission about true condition of Tibetan people in Tibet. I will have a copy of her book "The Same Sky". I am convinced from reading her mind that'sa representative of Chinese writers, students and activists that the middle way approach alone holds hope for mutually beneficial resolution of Tibet issue.